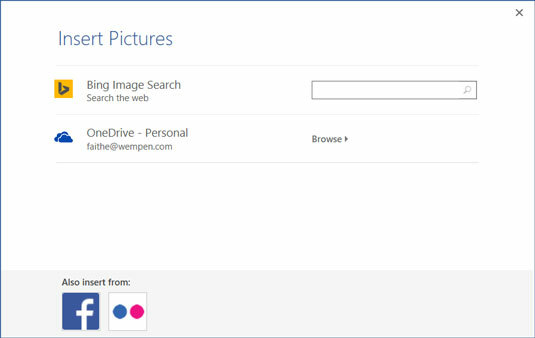 You can insert pictures into a Word 2016 document from your own picture stash on your local PC, or from online sources such as a Bing image search or your OneDrive. Choose Insert→Picture. The Insert Picture dialog box opens. Navigate to the folder containing the picture and click the desired picture. Click Insert. The picture appears in the document. From the Insert tab, click Online Pictures. An Insert Pictures dialog box appears. Click the Browse button next to OneDrive. A list of the folders and files on your OneDrive appear. Click the picture you want. The Insert Pictures dialog box. But what if you don’t have the photo you want? Office applications include a means of performing a Bing image search from within the applications themselves, so you can find an image without having to exit out to a web browser. Bing is Microsoft’s web search engine. In the search box next to Bing Image Search, type one or more keywords that define what you are looking for, and then press Enter. An assortment of images appear. See the following figure for examples. Scroll through the images, select the one you want, and click Insert. A Bing image search reveals several images from which to choose. 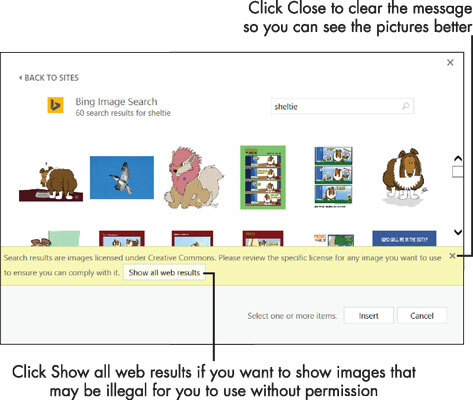 As the note overlaid on the search results shows, the images that Bing finds within Office are licensed under Creative Commons. This means they are royalty-free images that are okay to use for non-commercial projects. However, don’t count on an image being free to use just because it shows up in the Bing search results. If you are creating a publication that will be widely distributed, or sold, you should research the images selected to make sure the owners have not placed any restrictions on their use. When you select an image in the dialog box, a hyperlink appears in the bottom-left corner of the dialog box; you can follow it to the original image source, and from there you can glean information about its usage restrictions, if any. Microsoft no longer provides clip art for Office users. However, if you are specifically looking for clip art (that is, vector-based line drawings), try including the word clipart as a key term when searching.